The Trump administration is poised to allow American citizens to sue for property nationalised in Cuba following the 1959 revolution, a move that is expected to bring down foreign investment to Cuba and provoke another major US-EU dispute. Donald Trump's national security adviser John Bolton will reportedly announce these changes, along with new sanctions targeting Venezuela and Nicaragua, in Miami on Wednesday. The expected speech will coincide with the 58th anniversary of a US-sponsored botched invasion of the Bay of Pigs by forces which sought to overthrow the government of Fidel Castro. The changes will concern the 1996 Cuban Liberty and Democratic Solidarity (Libertad) Act, also known as the Helms-Burton Act, which targeted the Cuban government with sanctions. For over two decades, US presidents have issues waivers on key provisions of the act, namely Titles III and IV. 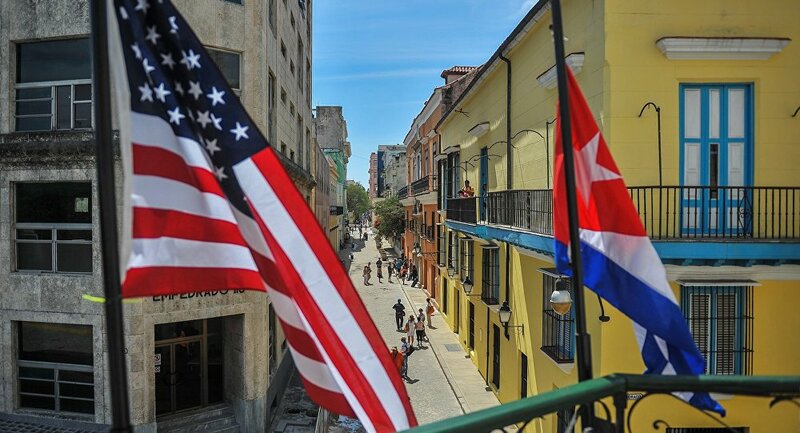 The former authorises US citizens, whose commercial property had been seized from them by the Cuban Government after the 1959 revolution, to sue persons and entities that profit from such property. The latter enables the US government to deny visas to anyone who has confiscated the property or "trafficked" in it. Donald Trump is thought to be lifting suspensions on these provisions in a bid to ramp up pressure on Cuba, Venezuela's long-time ally, which the US accuses of propping up President Nicolas Maduro. It comes days after the US Treasury announced more sanctions designed to curb Venezuela's provision of oil to Cuba. Trump's decision to further tighten sanctions targeting Havana was denounced by Washington's European allies. "We strongly condemn" the move, EU ambassador to Cuba Alberto Navarro was quoted as telling reporters. "This will create even more confusion for foreign investments that are helping create jobs and prosperity in Cuba." "The extraterritorial application of the US embargo is illegal, contrary to international law and I also consider it immoral," he added. According to a letter to Mike Pompeo from EU's foreign policy chief Federica Mogherini and European Trade Commissioner Cecilia Malmstrom, Brussels is calling on Washington to grant a consistent waiver for EU firms and citizens, and is threatening to launch a WTO case if the US doesn't comply. "Failing this, the EU will be obliged to use all means at its disposal, including in cooperation with other international partners, to protect its interests," the letter said. Cuba on Tuesday denounced the latest move. "Before they climb euphoric at the crest of their dirty water wave, with evil purposes & lies, here is a touch of reality," tweeted Johana Tablada, deputy director for US affairs at Cuba's foreign ministry. Referring to United Nations votes urging an end to the Helms-Burton economic sanctions, she added: "What the #World truly asked #JohnBolton & #UnitedStates gov., very recently, in #NewYork was to remove its criminal #Blockade & #HelmsBurton against #Cuba," she wrote, referring to a vote in which 189 United Nations members voted against US sanctions against Cuba.